ABB, title partner of the ABB FIA Formula E Championship, will be the Official Charging Partner of Jaguar Racing in a new category of electric motorsport: the Jaguar I-PACE eTROPHY series. The eTROPHY races will be the official support series to 10 ABB FIA Formula E Championship races, held on the same weekends and on the same racetracks. The new racing season begins December 15 in Ad Diriyah, Saudi Arabia. In contrast to the specially designed single-seat racecars used in ABB Formula E, the Jaguar I-PACE eTROPHY series will feature racing versions of the same Jaguar I-PACE electric SUVs that are now sold to consumers. 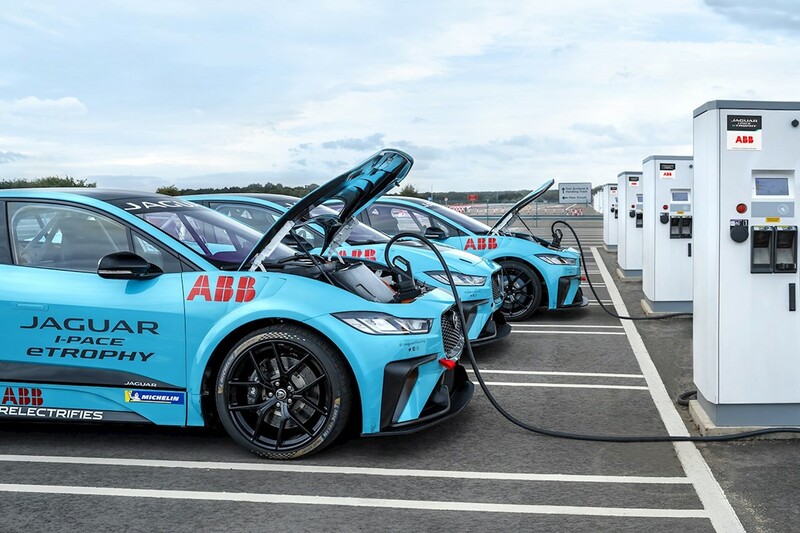 And the Jaguar racers will use ABB chargers based on the same charging stations now installed by the thousands around the world for use by everyday drivers of electric vehicles. Making this all possible required engineering ingenuity from ABB, the world leader in fast-charging technology. When the Jaguar I-PACE eTROPHY series was being planned, the company faced a complicated technical challenge – how to quickly recharge the batteries of up to 20 I-PACE eTROPHY racecars in the breaks between practice, qualifying and each race. And how to do that in 10 different cities on four continents uring the upcoming racing season. ABB’s Terra DC class of chargers were certainly up to the task. 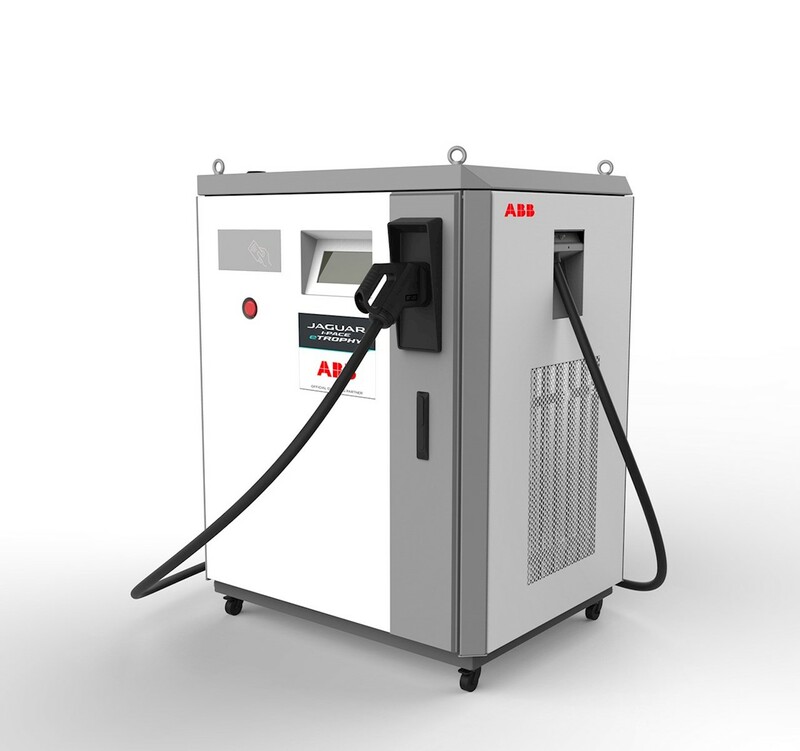 After all, they are ABB’s most popular charging stations now in use in Europe and the United States. There was only one catch. The chargers designed for public use are 2.2 meters tall – about the same size as a filling station petrol pump. But that’s too big to fit into the cargo holds of the jetliners that transport the series’ racers and equipment around the world during the eTROPHY season. These high speed chargers are also generally fixed in place and hard wired, and not intended to be portable. And so an ABB team in India reengineered a solution that repackaged the functionality of a Terra DC charger into a package on wheels and with a profile only 1.5 meters high, a reduction in height of almost 32 percent. And at Jaguar’s request, ABB’s team also designed a durable shipping enclosure that incorporates innovations like a built-in loading ramp and channels for handling by a forklift. Fortune Magazine recently ranked ABB #8 on its list of companies that are “changing the world” for the advances it has made in e-mobility and electric vehicle charging. ABB’s most powerful charger, the Terra HP, is capable of adding 200 kilometers (125 miles) of range to an e-car’s battery in as little as eight minutes – about the same time required to refill a conventional car’s fuel tank. As the world leader in electric vehicle infrastructure, the company’s full range of charging solutions covers electric cars, electric and hybrid buses, as well as electrification solutions for ships and railways. The company has an installed base of 8,000 ABB high speed chargers across 68 countries, more chargers than any other manufacturer.